ANS Vol 38:2 will focus on Models of Care for the Future. As nations worldwide seek to establish models of care that provide quality and efficiency, nurse leaders are emerging to play a significant role in the development of these models. For this issue of ANS we are seeking manuscripts that provide theoretical underpinnings of creative models of care, as well as evidence that supports their implementation. 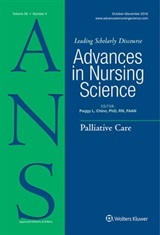 Manuscripts should be clearly grounded in a nursing perspective; the content can include philosophic, theoretic, empirical or ethical aspects related to the model. Manuscripts will be due October 15, 2014. For a complete updated listing of all future issue topics, and the due dates for manuscripts, visit the ANS web site!